The Museum will be running a temporary exhibit featuring Quilts made by Nowata County residents. The exhibit will run for 3 to 4 months. See the flyer for details. Saturday, February 17 from noon to 2:00 PM. Sand Springs Leader Managing Editor and Author Kirk McCracken wrote the book “Because of the Hate” starting in 2003 and it’s taken around 14 years to finish. It was released on Amazon.com in paperback and e-book, Friday, Jan. 15, 2018. In Sapulpa, the murder of beloved football coach Jerry Bailey was never really talked about, fueling rumors, speculation and unanswered questions. Now, over 40 years later, those questions can be answered. The true story of the murder of Jerry Bailey guides the reader through the murder, investigation, trial, and how two small Oklahoma towns tried to cope with the gruesome death of their coach. Jerry Bailey was also the head coach at Nowata in 1970, and that Ironmen team had a very special season. McCracken was born in Bartlesville, Okla. in 1974 and his parents, John and Karen McCracken, lived in Nowata until moving to Sand Springs several years later. He is the grandson of Jessie Slack and Bob Paige of Nowata. In 1980, his parents moved the family to Sapulpa, where they live to this day. The book will be available for purchase at the event for $15.00. The Nowata County Historical Society is pleased to announce the latest happening at the Glass Mansion. Get your taste buds ready for “Our Big Fat Italian Dinner” which will occur on February 10 starting at 6:00 pm. Reservations are required for this sit down dinner with musical entertainment provided by the Tenor Twins, Amber and Zachary Solomon. Reservations must be made prior to February 2 by calling Debbie at 918-273-3629. You will get an answering machine so please leave a complete message. Seating is limited. Cost is $25 for a couple and $15 for an individual. Questions call the Museum at 918-273-1191 or the RSVP number. The television show “American Pickers” will be filming in Oklahoma this October and November. The hosts are looking for people in the area with unique antique collections and interesting stories behind them. Individuals only, no stores etc. See the flyer if interested. Ladies, mark your calendar on Friday, October 27, 2017 for the Historical Society’s next Tea Party. Entertainment and food provided. From 1:00 to 3:00 PM. Cost is $15.00 per person. Reserve your spot by calling the Museum at 918-273-1191, Tuesday thru Saturday, 10:00 AM to 4:00 PM. See flyer for more details. The Historical Society will be hosting a Brunch and Fashion Show at the Glass Mansion. Make plans now to attend. The new Museum facility is up and running and accepting visitors during regular hours of operation. The Grand Opening celebration will be held on Saturday May 6th.There will be many activities for all ages. Plan a visit to the Museum soon. A number of Cherokees served as military “Code Talkers” in WWI and WWII. One such soldier was Nowata resident and Cherokee Nation citizen George Adair. Born in Braggs, Okla., May 24, 1887. He was married in Nowata, OK in 1907 to Edna F., daughter of Mr. and Mrs. Adolphus McCoy. Adair enlisted in the U.S. Army in September of 1917. 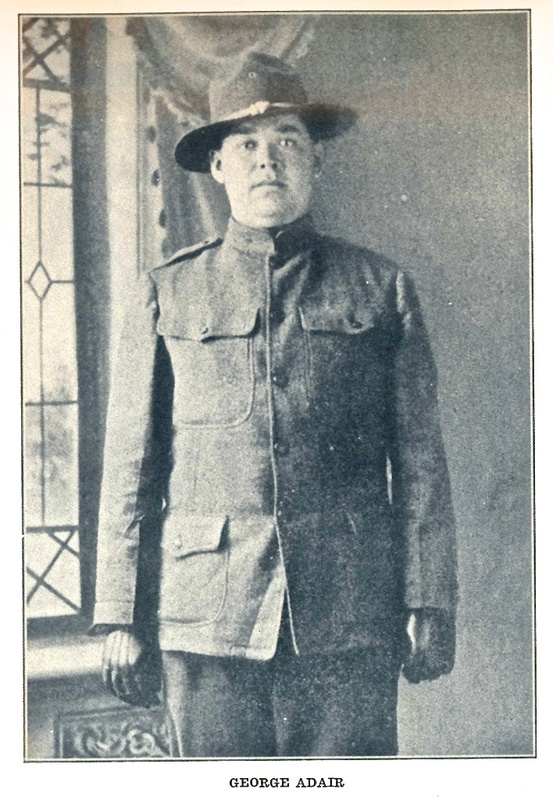 After his basic training, Adair was assigned to the 36th Division and sent to the line in France in World War I. Adair, along with other Cherokees, was put in the telephone service. It was those Cherokee soldiers’ responsibility to receive and transmit crucial orders in their native language. Cherokee and other tribal languages were alien to the enemies of the Central Powers, rendering them unable to decipher the American communications spoken in those languages. Unfortunately only Adair’s name remains known among the Cherokee who performed code talking services. The Cherokee Nation is seeking information from relatives of any other Cherokees who may have served in this capacity. Historians say it is impossible to know how many Allies’ lives were saved thanks to the Cherokee and other Native code talkers in both World War I and World War II. Learn more about our veterans by visiting the Museum (Re-opening this summer).